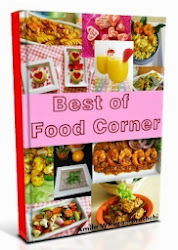 In my Blog always share my recipes & cooking experience. Today I thought of writing of a great personality I admire. 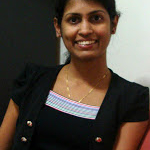 He helped & helps me a lot in my cooking experiments, so it is worth writing a note about him. Simply he is a chef with a lot of local & foreign experience, a humble character & always he has a smile in his face. 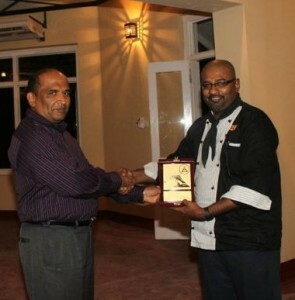 He is Chef Duminda Abeysiriwardana. Here are my reasons why I like Chef Duminda. 1) Chef Duminda is an extremely hard working person, a good example for the others who wastes their time & blame to the government for their failure of everything. (as many Sri Lankans do) As I know, his past is not a smooth journey. He has come this much because of his determination & efforts. I admire that a lot. 2) He is accessible. 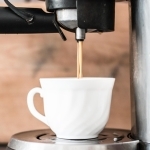 Unlike other celebrities or recipe website owners in Sri Lanka, he is always willing to share his experience or reply to any of our difficulties found when trying a recipe. I was really surprised when I received a quick reply from him for a quarry regarding a recipe. 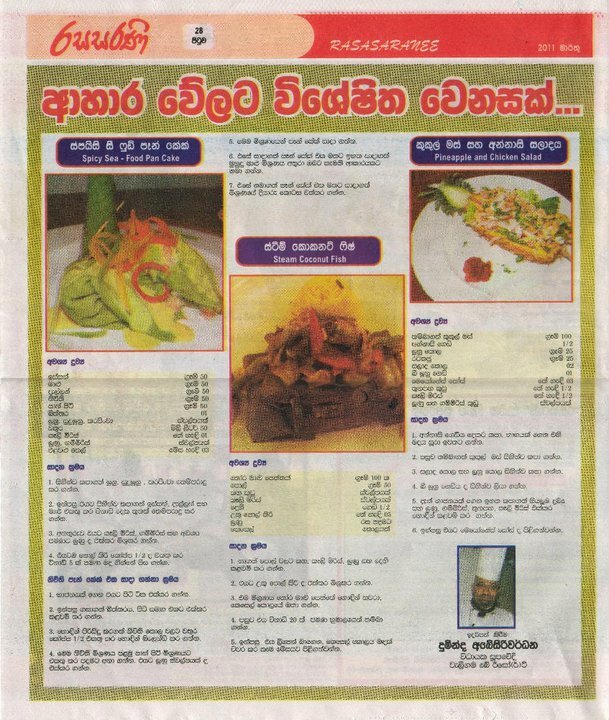 Earlier I have asked few quarries from some others who shares Sri Lankan recipes, even they are not celebrities, but I didn’t get any reply. 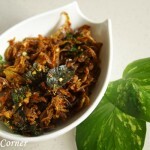 That is a main reason for me to start my own Blog thinking I can help the others regarding Sri Lankan cooking. 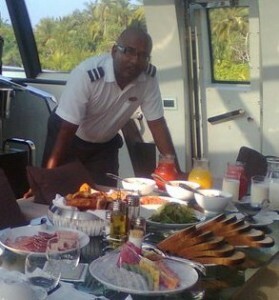 But now I know Chef Duminda also does the same service to Sri Lankans. Chef;this is for you. Please continue the same style. Do not forget people around you with the increasing popularity. 3)I like his cooking style. Why I like? I was watching many TV programmes from few years. I want to say those demonstrators are good. But they always select a recipe to share which we need to buy all the ingredients, some we haven’t heard or may be it is really not matching with other Sri Lankan food. As most Sri Lankans need a typical meal everyday, it is not easy to try a separate dish which is not matching with the other dishes. 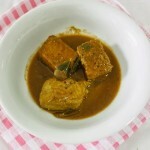 But I have noticed that Chef Duminda’s recipes are always matching with typical Sri Lankan food. 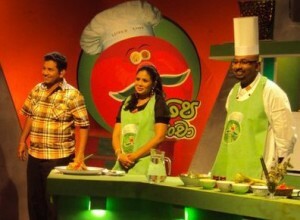 In his programmes he tries to introduce a new recipe, but using common ingredients. Also I can see a Sri Lankan signature in those international dishes he introduces. Therefore it is very easy to introduce his recipes to my family. 4)Chef Duminda actually knows what he talks about. Unlike many other cooking demonstrators, he explains the recipe well. My experience from Sri Lanka is, most of those celebrities talk 95% of nonsense & only 5% about the food. This is something I hate to see. We need to watch the television with mouth open to find the recipe. I am not criticizing the others. But I want to highlight Chef Duminda’s quality. Cant blame, they also follow the instructions of media owners. But so far, Chef Duminda doesn’t waste our time in his programmes. 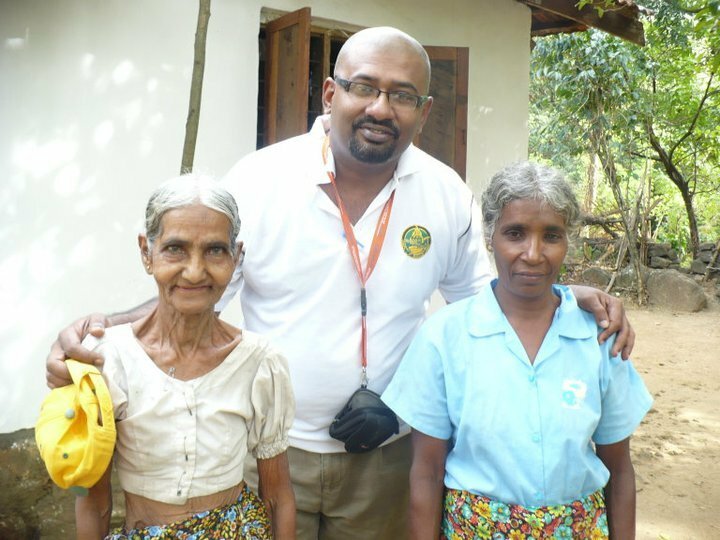 5)Chef Duminda does a lot of social service to Sri lanka.He is not only a chef, he is a nature lover too.Also he does a lot charity work, sharing his knowledge with others, helping others to make their culinary journey a success etc.Is this cannot be a fact to admire him? 6) He is an informative person. He not only knows about cooking, but a well aware of things happening around the world. Just I would like to say he is an all rounder. 7) I like his food presentation style. As a chef he should know these things, that’s true. But I see some specialty in his presentation. I like it much. That is a main reason to start me to search his recipes & connecting with him via his Facebook page. 8) After all above, the most thing I like is, he is a humble person lives in a normal simple lifestyle. By talking with him I understood he is a simple person more than a celebrity. Is this not a thing to admire a person? Seems I cannot stop writing, there are lots of things to write down. But I need to stop it now. If not Chef would think that I am over praising him. Oh no, I am not over admiring him. But I am a person who admires the right thing at the right time. Dear Chef Duminda, Thanks a lot for all your services to Sri Lankans. 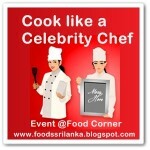 We need more chefs & more food bloggers, demonstrators who can spread Sri Lankan food around the world. But we have to start it from our country. First we need to spread this to our Sri Lankans. You have initiated it. Now it is time to make a further step. You have strength to that. I wish you all the very best in your future endeavors!! Here is one of my recipes I tried from him.